If you are a fan of Michael J. Fox, there is some great news for you. Michael is back with a new television series this fall. It's called The Michael J. 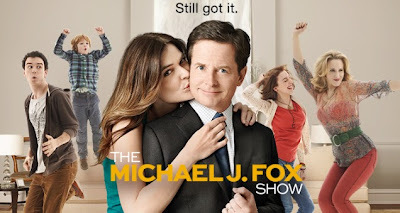 Fox Show and it premieres on the NBC network on Thursday, September 26 at 9:00 p.m. with a special one-hour episode. After that, it will be seen in its regular Thursday night at 9:30 time slot. The cast also includes The Wire's Wendell Pierce as Harris Green, Mike's ex-boss, Kay Costa as Ann Nogueira and Anne Heche as fellow anchor and arch-rival Susan Rodriguez-Jones. The series is set in New York City and it is loosely based on Michael J. Fox's own life. It is an attempt to look at Parkinson's with grace and humour. Michael told People magazine (August 13, 2013, "Michael J. Fox Mines His Parkinson's Disease for Laughs on New NBC Show") that "I have challenges that come with Parkinson's but my experience is to deal with things through humour." Below is a photo of the cast of the Michael J. Fox Show - Clockwise:from top left: Betsy Brandt. Conor Romero, Katie Finneran, Juliette Goglia, Jack Goor and Michael J. Fox seated in chair. Michael J. Fox was born in Edmonton, Alberta, Canada on June 9. 1961 and raised in the Vancouver suburb of Burnaby, British Columbia. He now holds dual Canadian and American citizenship. The actor rocketed to television stardom back in 1982 with his portrayal of a conservative Republican teen named Alex P.Keaton on the hit series Family Ties. On July 16, 1988, Michael married actress Tracy Pollan who played his girlfriend Ellen on Family Ties. The couple recently celebrated their 25th wedding anniversary and are the parents of four children: Sam Michael Fox (born May 30, 1989), twins Aquinnah Kathleen and Schuyler Frances (born February 15, 1995), and Esmé Annabelle (born November 3, 2001). Above is a photo of Michael and Tracy at the Emmy Awards in August 1998, not long after their marriage. Fox was diagnosed with Parkinson's Disease in 1991 (when he was about 30 years old) but did not reveal his illness to the public until November of 1998. In 2000, while starring in the ABC sitcom Spin City, Michael's symptoms became more pronounced and he announced his plans to semi-retire. At the end of show's fourth season, he left his role as New York City's Deputy Mayor, Mike Flaherty. His character departed from City Hall and moved to Washington, D.C.
After Michael left Spin City, Flahery was succeeded as Deputy Mayor by Charlie Sheen's character, Charlie Crawford. Spin City remained on the air until 2002 and Michael made three guest appearances on the first three episodes of the show's sixth and final season. The episodes were broadcast in September and October of 2001. Since then he has appeared in limited roles and guest appearances. In 2004, Fox played a guest role in two episodes of the comedy/drama Scrubs as a surgeon, Dr. Kevin Casey, with a serious obsessive-compulsive disorder. In 2006, he appeared in six episodes of Boston Legal as a David Post, a lung-cancer patient. In 2009, he guest-starred as Dwight in five episodes of Rescue Me, an FX network comedy/drama about firefighters, for which he earned an Emmy nomination for best guest appearance. Since 2010, Michael has also had a recurring role as lawyer Louis Canning on The Good Wife. Michael used his career break to focus on his health and to spend time with his family. He also became an outspoken activist in support of Parkinson's research and started the Michael J. Fox Foundation. In a recent interview on Entertainment Tonight, Fox declared that he was ready to appear in a new series. He stated, "It was all building up to where I asked myself 'why can't I do this? I couldn't come up with a good reason." * Michael J. Fox was born Michael Andrew Fox. He uses Michael J. as his professional name to honour veteran Hollywood character actor Michael J. Pollard, best known for his portrayal of C.W. Moss in the 1967 film Bonnie and Clyde. * When he was 15 years old, Michael starred in the Canadian television series Leo and Me on the CBC network. In 2002, it emerged that in addition to Michael, three members of the Leo and Me crew had been diagnosed with Parkinson's. It was revealed that director Don Williams, along with a writer and a cameraman, had been stricken with the disease. An investigation was launched to determine why such an unusually high number of former cast and crew of the production had developed Parkinson's. * Matthew Broderick was actually the producers' first choice to portray Alex P. Keaton on Family Ties. Michael J. Fox was given the role because Broderick was not available at the time. He turned down the part role because his father, James Broderick (Doug Lawrence in the television series Family which ran from 1976 to 1980) was gravely ill with cancer in New York City. Fox and Broderick both shared the same boyish looks and were able to play younger roles. Michael was in his early 20s when Family Ties debuted and Broderick (born March 21, 1962) later starred as a high school student in the 1986 coming-of-age film Ferris Bueller's Day Off. * Michael has written an autobiography called Lucky Man: A Memoir (2002) in which he chronicles his battle with Parkinson's and his success in overcoming the drinking problem he developed after discovering he had the disease. He is also the author of two other books: Always Looking Up: The Adventures of an Incurable Optimist (2009) and A Funny Thing Happened on the Way to the Future: Twists and Turns and Lessons Learned (2010). Readers, if you want to do something truly worthwhile today, I urge you to make a donation to the Michael J. Fox Foundation for Parkinson's Research. It's only a click away.